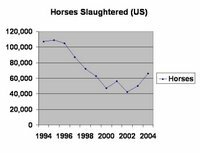 A steady decline over the last decade is the first thing you notice when you look at the numbers related to horses slaughtered in the United States. 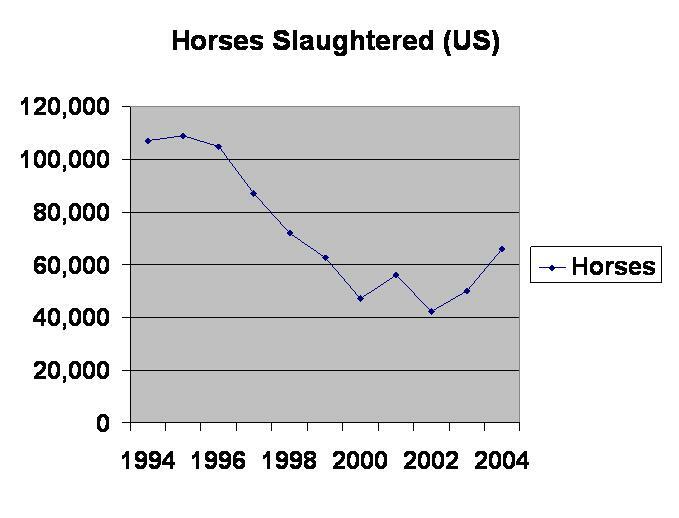 This, although, 2004 saw more horses slaughtered than any year since 1998. And I know this is kind of boring, but if you read on this post gets more entertaining, I think anyway. Clearly there are less plants in operation today than there were in 1994. The Cavel West Plant in Redmond, Oregon suffered a toasty fate at the hands of animal rights activists in the interim. Interestingly enough, the DeKalb, Cavel International horse slaughtering plant suffered a similar fate, though it was later rebuilt after having its relocation elsewhere in Northern Illinois rejected a couple of times. I know I said I was going to post about the Federal Meat Inspection Act but I got that email and couldn’t resist. I will post about it in my next update, promise.